DP and broking : "Prevent Unauthorized Transactions in your trading/ demat account --> Update your Mobile Number/e mail id with your Depository Participant/stock brokers. Receive alerts on your Registered Mobile/ e mail id for trading account transactions and for all debit and other important transactions in your demat account directly from CDSL/stock exchanges on the same day......................issued in the interest of investors." KYC : "KYC is one time exercise while dealing in securities markets - once KYC is done through a SEBI registered intermediary (broker, DP, Mutual Fund etc. ), you need not undergo the same process again when you approach another intermediary." Proprietory Trading: We and our associate company are engaged in client based business and proprietary trading as well as per SEBI Circular NO. SEBI/MRD/SE/CIR-42/2003 dated November 19 2003 & circular no. SEBI/ HO/CDMRD/DMP/CIR/P/2016/49 dated 25 April 2016. 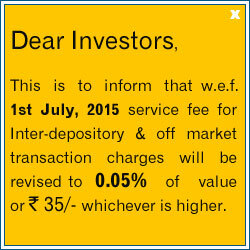 SEBI : "No need to issue cheques by investors while subscribing to IPO. Just write the bank account number and sign in the application form to authorise your bank to make payment in case of allotment. No worries for refund as the money remains in investor's account."